I was following my wife through a “junk store” several years ago when all of a sudden I found something that piqued my interest. 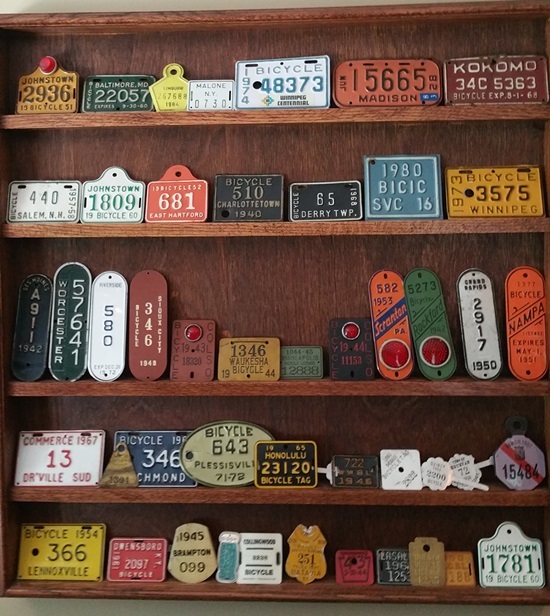 She would take me to several antique stores on weekends and I went along for the ride but never really had any interest in the available items until the day when I saw what appeared to be a miniature license plate. For the first time, I spoke up and asked the store clerk a question. Until that moment, he had to think I was a deaf, dumb mute whose only job was to carry around my wife’s wallet! I asked, “Was this plate for small cars?” That is when he explained to me it was a bicycle license plate. This peaked my interest because I am an avid road bicyclist. I ride on average 5,000 to 7,000 miles a year and I ride all over the East coast. The first thing that I found funny about this plate was its sheer weight. It was made of metal, was about six inches long and two inches wide and even had a reflector on it. You see, high end road bikes made today are carbon fiber. You can spend hundreds of dollars more for a gear or a tire just to save a few ounces in weight. Having to bolt a plate to my bike would send me into shock! I bought that plate because it was cheap and intriguing and because I wanted to learn more about it. Little did I know that was the beginning of me becoming a collector. 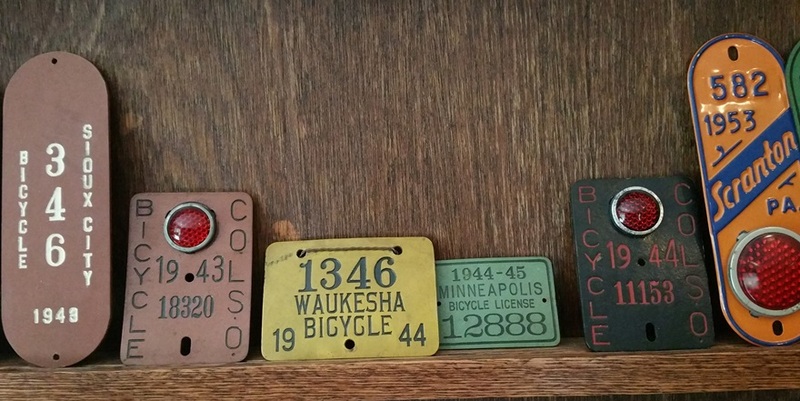 In my collection, bicycle license plates date back to the late 1800’s. They have evolved over time in size and shape and for the most part, have been phased out. 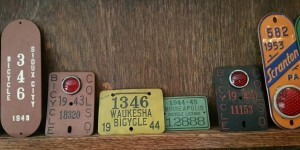 Bicycle plate collections really fall into two categories, government issued and cereal box prizes. I started with a focus on just the government issued ones. I found it funny that state and local governments would put so much effort into being sure all bikes were registered. 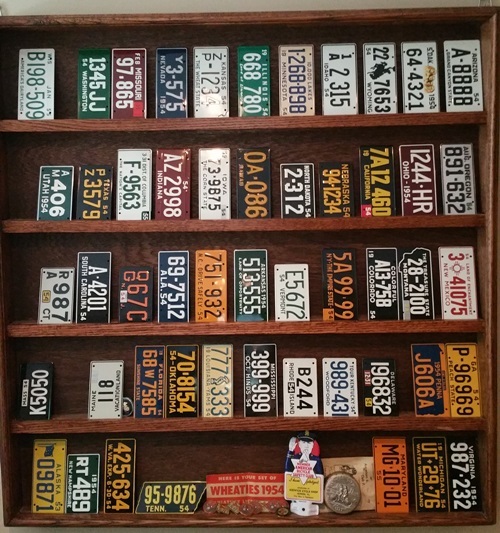 Governments justified this exercise of licensing plates in several ways. First, they would tell the community this was a way to hold cyclists accountable for law infractions. Then, they would say it would reduce bike thefts. Rarely did they come out and admit they were doing it for the money! Cars with license plates break laws every day so that is not a valid argument. Bikes would get stolen every day and what do you think the thief would do? Why, the first thing they would do is take the plate off and throw it in the woods! It always boiled down to dollars and cents. At first, my focus was muddy at best. If a plate had a nice patina or come from a unique location, I bought it. It is an expensive item to collect, but over time I had a collection that was taking over my office. That is when I made a deal with myself that any plate I bought had to be at least as old as me. I have sold off several plates that did not fit that description, but still I need more room. I have some old plates from the turn of the twentieth century, but I think the ones I like the best came from the World War II era. I have some plates from 1943 to 1946 that are made out of a hard wakeboard material. During the war, all metal was being used to make planes and bombs, but the government still needed to be funded back home. I have heard stories where you had to be careful when leaning your bike up against a farm fence. You might come back and find a cow eating your license plate. Today I have plates from around the world, and I am constantly looking for new ones. As a kid, I remember seeing the tin plates advertised as prizes in cereal boxes. As I got older, those plates went from tin to plastic. I never really had an interest in collecting them because I knew they were plentiful. That is, until I saw a complete set of them for sale on iCollect247.com! 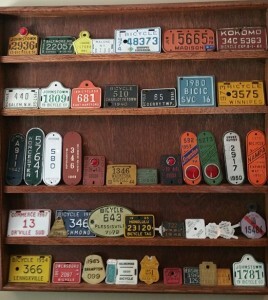 Many people enjoy the hunt and they scour the Internet in search of all the plates in a particular set. As a kid, I never had an interest in these cereal box prizes because there was a new set every couple of years or so, and I knew my mom would not let me eat enough Wheaties to get the entire set! Apparently, there was another young child who felt the same way I did, but in his case, his parents were willing to pay for the entire set. In 1954, General Mills was introducing its latest set of 51 plates. There was an order form where you could purchase a group of plates, Eastern, Southern, Midwestern or Western, for 25 cents. This kid bought the entire set for $1 plus shipping and handling. He was obviously a spoiled kid, though, because the set was never opened. It was still in the original shipping envelope and each plate was individually wrapped in tissue paper and it came with a letter from General Mills congratulating the kid on his purchase. I paid a bunch more for the set than he did, and today I have that set hanging in my office. 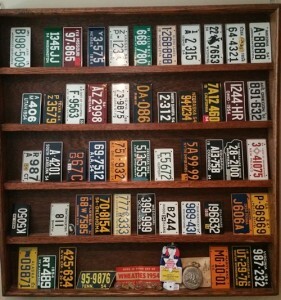 This passion for collecting license plates has taken another step, much to the chagrin of my wife. A few years back I was searching online for license plates when I found one that was attached to the entire bike. The bike reminded me of an old ‘tank’ of a bike I had as a kid so I thought, what the heck, send me the bike and the plate. That bike led to another, and then another and now today, I have four vintage bicycles from the 1940’s and 1950’s. I was blown away by the size and weight of these bikes. 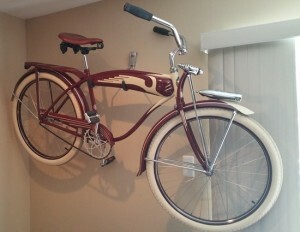 Kids in the fifties had to have calves as large as tree trunks to pedal these things! I have bought and sold several other bikes since then and when I have to ship a bike it will often weigh between 70 and 100 pounds. I paid several thousands of dollars for my modern road bike in order to get it under 16 pounds! Bikes are more expensive to collect than plates are, but there has been one cool thing to come from my new passion. As a kid, my wife was not allowed to ride a bike; it was not “lady like”. I, on the other hand, spent my whole childhood on a bike (and a fair amount of my adulthood). Recently, I told her I was going to sell one of my bikes because it is not as old as the others. As it turns out this particular bike was her favorite. She liked the green color, the big seat and the wide handle bars. That was not going to be enough for me to keep it though, so I said, “If you like it so much, why not ride it?” To my surprise, she told me if I took it off the wall and pumped up the tires, she would ride it. This evening, if you ride through our neighborhood, you are likely to see her on the Columbia Built Five Star Superb and me either on the 1940 Henderson of the 1951 Schwinn Black Phantom.